How do animals prevent and treat disease? A fascinating exhibition, showing other ways the animal kingdom prevents and treats infection and disease, goes on show in Central Library from tomorrow. Learn about how chimps use rolled up leaves to remove gut parasites; how honey bees treat infection in their hive and how humans commonly use the environment in which they live to treat and/or prevent infection, whether treating nettle rash with dock leaves or taking Aspirin – a drug originally developed from Meadowsweet. The exhibition is on until Tuesday 15th April and there’s a related activity trail taking place in the Zoo on Wednesday between 10am and 4pm, which is free with Zoo admission. Part of the Edinburgh International Science Festival, in partnership with the University of St Andrews and RZSS Edinburgh Zoo. 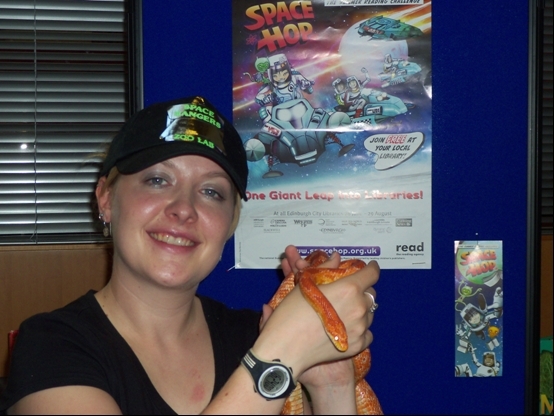 Zoolab visited Leith Library as part of the Summer Space Hop Reading Challenge 2010 activities. Over 20 children and parents enjoyed this fascinating talk about insects and small animals which have survived for millions of years and who knows, may be living on another planet at this very moment. The children had the chance to handle a range of live animals including a snake, frog, giant millipede and rat, but only looked at the tarantula in its box!